Welcome to the last post in our Backpacking Yunnan series! We hope you’ve enjoyed reading about the other places on the route. It’s a pretty beaten backpacker path starting with the capital, Kunming, then heading to Dali, Lijiang, Tiger Leaping Gorge, and Shangri-la. Today we want to introduce you to a town that isn’t on the beaten path, making it the perfect place for the intrepid traveler. If you’re tired of the crowded streets of Yunnan’s more popular destinations, Shaxi Ancient Town is the place for you. It’s full of history and culture. Plus, it’s incredibly beautiful and not that hard to get to. 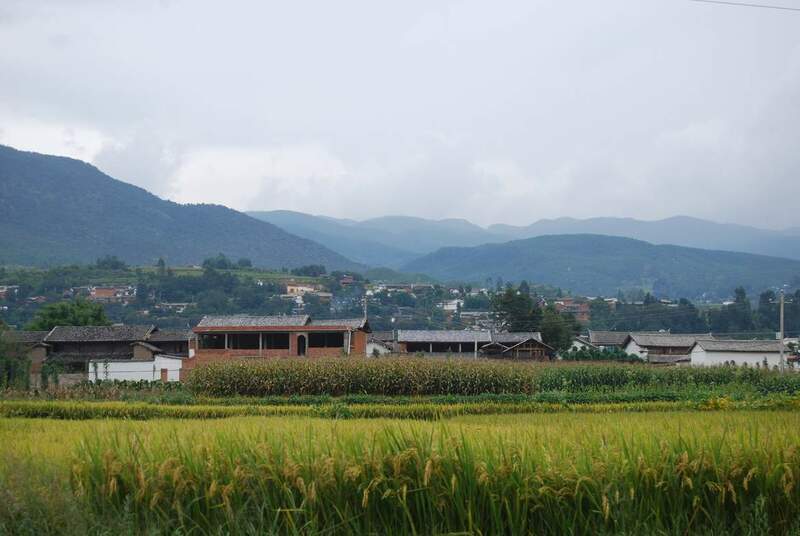 Would you like to visit Shaxi? By the Ming and Qing Dynasties, the Shaxi Valley was flourishing with trade. It attracted people from many different ethnic groups and cultures – the Hani from Southern Yunnan traded tea and cloth, the Muslim Hui brought yak furs and horses, and the Naxi from Lijiang traded timber. This all came to an end in the 1950s when the Communist Party put a ban on private markets. The locals reverted back to agriculture and the area was mostly forgotten and left in isolation. The market square of Shaxi. In 2001 the World Monument Fund added Shaxi’s market square to its Watch List of 100 Most Endangered Sites and so the local government began a restoration project with the funds it was given. Now it has attained UNESCO World Heritage status and is slowly beginning to attract more and more curious travelers looking to escape the crowds of Dali and Lijiang. Getting to Shaxi isn’t hard, but it requires a few extra steps. The roads to the village are very small and windy. Therefore big buses don’t go there because it’s impossible. First, you have to take a bus to Jianchuan. From there you’ll hop in a mini bus outside the bus station. They are always there waiting and head out once they fill up. The mini bus takes about 45 minutes. As I mentioned, it’s a windy road, so take precautions if you’re prone to car sickness. A great place to stay in Shaxi. There are a surprising amount of cool places to eat, drink, and sleep in Shaxi Ancient Town. We stayed at Horse Pen 46 Youth Hostel in a nice private room. It’s an old Bai-style courtyard where travelers would bunk their horses when they came for the markets. They have a restaurant, their own bar behind the main building, English-speaking staff full of great advice for things to do in the area, and two humongous Tibetan dogs. Our favorite restaurant was the Hungry Buddha. It’s a vegetarian restaurant where everything is homemade. They have pizza, pasta, homemade bread and cheeses, and really good wine. Everything is all made with local, organic ingredients and it’s always delicious. It’s a really cool restaurant but it’s tiny, so make sure to get there at a time when you can get a seat. The restaurant is set up like a sushi bar so you’re able to watch the cooks in action. Shaxi Ancient Town is a great place to go for some R&R as there isn’t much to do. There are mountains all around with hiking trails that lead to great views. The local village people use the trails to travel between villages, collect firewood, and search for wild mushrooms. The Heihui River runs through the town and it’s possible to kayak from the northern end back into the town. Ladies dancing by the river. Go ahead and join in! Many of the hostels and guesthouses have free bicycle rental. This is a great way to travel between all the different villages in the valley and find some hidden gems along the way. Of course, there is horseback riding available here, given its history as a horse trading spot. Hike up to Shibao Shan. Book a tour taking you to the nearby Shibao Shan, a mountain nature reserve area where you can also see the Baoxiang and Shizhong Temples. Alternatively, you can just walk up the hill to enjoy the views back towards town and a few Buddhist carvings. It’s certainly cheaper than taking a tour to the temples, and chances are you’ll have the whole place to yourself. You won’t see any flag-following tour groups out here, but you will see a few farmers and herders with their goats. The only crowd you’ll see out here. Being that we were at the end of our Yunnan backpacking trip and had just finished our massive gap year trip, we were pretty tired and running low on funds. We wandered around the town, ate delicious food, and chilled out at the hostel. Checking out the Friday Market was really the only thing on our to-do list. Everyone comes out to the market. Once upon a time, Shaxi was a large market place every day. These days the market only goes on once a week, which makes it a big deal for people living in the surrounding villages. Every Friday, people will trek down from their mountainous villages to the town, dressed in their colorful, traditional clothing, leading pack mules, and carrying large baskets on their back. Just about everything is for sale at the Friday market – fresh produce, meat, fish, daily items, and even electronics. You can even get a wig made or see a dentist on the side of the street. Walking through the market is quite the experience, and is tons of fun for photographers. Experiencing the Friday market is definitely a highlight of visiting Shaxi, so be sure to plan your visit accordingly. It starts in the morning between 9-10, and things usually wind down by about 2. After all the excitement of our Yunnan backpacking trip, Shaxi Ancient Town was the perfect place to wind down. A few days of relaxing, a bit of light hiking, plenty of delicious food, and the vibrant market was just what we needed before diving back into work. It was one of our favorite places in Yunnan, and we highly recommend you get there before the matching hat tour groups arrive. Hi, Michelle! I’m so happy to hear that the post was useful for you. You’re going to love Dali and Shaxi. Both are such beautiful places. Feel free to reach out if you have other questions!